Monumental moment: Friends of the Monument's Agnes McPhetres presented then-First Lady Laura Bush with Mariana Trench t-shirts on the day the Marianas Trench Marine National Monument was created by then-President George W. Bush. SAIPAN, Northern Mariana Islands – Former First Lady Laura Bush recently wrote to the Friends of the Monument thanking them for their role in supporting the creation of the Marianas Trench Marine National Monument. Friends of the Monument’s Agnes M. McPhetres presented then-first lady Bush with two orange Mariana Trench Monument t-shirts after the monument declaration signing in Washington, DC on January 6, 2009. The letter from the former first lady included an autographed photo of her and former President George W. Bush. The Friends of the Monument were the main proponents for a marine monument in the Marianas. When local elected leaders were not receptive to the idea of a marine monument, the Friends started a petition drive and collected over 6000 signatures from local residents. They also gained endorsements from the business community and prominent community leaders. 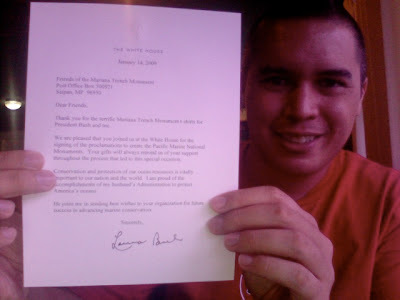 Silly grin: Friends of the Monument's Angelo Villagomez and the letter from Laura Bush. Friends of the Monument officers Agnes M. McPhetres, Ignacio V. Cabrera, and Angelo O. Villagomez were on hand to witness the historic monument declaration this past January. The Friends of the Monument formed in the Spring of 2008 to express the voice of the local community and consists of a cross-section of indigenous and resident people of the Commonwealth of the Northern Mariana Islands who are dedicated to the conservation, preservation and protection of marine flora, fauna and geological features of the oceans; and the creation and proper management of a Marianas Trench Marine National Monument. More information on the Friends of the Monument and the Marianas Trench Marine National Monument can be found at http://marianamonument.blogspot.com. SAIPAN, Northern Mariana Islands – The Friends of the Monument were informed this week that they are to be recipients of a 2009 EPA Environmental Award on April 16. The award seeks to recognize individuals and groups outside of the EPA who are making significant contributions to improve the environment. 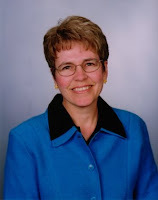 Jane Mack of the Friends of the Monument was the first person notified about the award. "I was really excited to receive the dawn telephone call from Wendy Chavez at EPA, telling us that Friends of the Monument would be recognized as an award winner," Mack said when asked about the award. "I nominated the community organization for special recognition because the Friends worked hard and its members put their hearts and souls into the campaign for a monument. The Friends efforts directly contributed to the eventual designation of the Monument by President Bush." The award is open to people and groups who are working all across California, Arizona, Nevada, Hawaii, the Pacific Islands and tribal lands to protect public health and the environment. This year over 200 nominations were made, but only 40 winners will be recognized. “It is an honor to be recognized by the EPA for our work. This is an award the Friends will share with all our supporters, especially the Pew Environment Group,” said Friends Chairman Ignacio V. Cabrera about the award. On January 6, 2009, then-President George W. Bush declared 190,000 square miles of ocean as marine monuments, closing parts of them to mining and commercial fishing, including the 95,000 square mile Marianas Trench Marine National Monument. The Friends of the Monument were the main local proponents of the Marianas Trench Marine National Monument. They worked to build and showcase local support to convince then-President Bush to declare a monument around the three northernmost islands in the Marianas archipelago. The Friends of the Monument waged an old-fashioned door-to-door grassroots campaign to build support for the monument. Wesley Bogdan, a local attorney and one of the Friends of the Monument said of the monument declaration, "The creation of the monument shows that the system can work, that the people actually do have the ability to affect their government to some degree. The Friends of the Monument's hard work and receipt of this award from EPA can help spread that message and hopefully encourage more people to get involved and work on projects important to their community." Initially local leaders were not receptive to the idea of a marine monument, so the Friends started a petition drive and with the help of 60 volunteer petitions gatherers, collected over 6000 signatures from local residents. They also made presentations to local junior high school, high school, and college students, which resulted in over 500 handwritten support letters being sent to President Bush. During a White House sponsored workshop, the Friends recruited over 400 supporters to attend. Most were wearing orange, as the workshop took place during the Friend’s sponsored WOW Week – Wear Orange Week. They worked with the local business community and signed 206 businesses on to support the monument, including the Chamber of Commerce, Hotel Association of Northern Mariana Islands, Tan Holdings, DFS, and McDonalds. They also organized a letter writing campaign in support of the monument. Over 100 current and former community leaders sent letters to then-President Bush in support of the monument. Constitution writers Dr. Joaquin A. Tenorio and Karl T. Reyes and business leaders David M. Sablan and Manny S. Villagomez were among the prominent letter writers. Officers of the group also traveled to Washington, DC on two occasions to meet with federal officials and national media outlets. Mike Tripp, a local dive operator commented about the grassroots campaign, "If it were not for the Friends of the Monument, the monument designation would never have happened. The organization stands as proof that individuals coming together for a common cause can truly effect positive change in their own backyard, and also for the benefit of the planet". A few weeks ago during the monthly cleanup of the Garapan tourist district, one of the volunteers, a student at Saipan Southern High School, confided in me that participating in the cleanup made her really frustrated and angry. Having done 30 cleanups of Garapan since October 2006, I understood where she was coming from. We clean it up every month, as do a number of other groups including the Department of Parks & Recreation, but it is still a mess when we come back on the first Sunday of every month. Anyway, I suggested to the student that she write a letter to the editor expressing her frustrations. It was published in the Marianas Variety yesterday. I AM a sophomore at Saipan Southern High School. Last week I participated in the Beautify CNMI monthly cleanup of Garapan and was terribly frustrated by all the garbage I found in almost every corner. After spending 90 minutes under the hot sun, my partner and I filled up about four huge bags with trash. The majority of this trash consisted of beer bottles, paper plates, and cans — all things that could have easily been disposed of properly. When I went home, I looked up some information about littering. I found that the CNMI has a Commonwealth Litter Control Act of 1989 (Public Law 6-37) that provides for a $500 fine for littering and that the Division of Environmental Quality, the Mayor’s Office, the Department of Public Works, the Department of Public Safety, the Department of Public Health, the Division of Fish & Wildlife, Coastal Resources Management, the Department of Land and Natural Resources, and the Marianas Visitors Authority all employ litter control officers. Knowing this information, I wonder how many litter tickets have been issued in the last 12 months? If our Commonwealth Litter Control Act were enforced, we would have a cleaner island. A cleaner island would benefit tourism and improve the quality of life for everyone who lives here. I ask that the government enforce our litter law so that people like me don’t have to spend our weekends picking up other people’s garbage. I also realize that the community and businesses are responsible and I ask that they stop littering and put pressure on those who do to stop. The Marianas Variety ran a follow up story to the letter in today's paper. THE litter control officers certified more than two years ago have other full-time jobs in different government agencies and this prevents them from going after violators of the Litter Control Act, Division of Environmental Quality spokeswoman Reina Camacho said. The litter control officers can issue citations and report violations whenever they witness people dumping trash in public premises, she said. But littering usually happens either at night or early in the morning — when litter control officers have not yet reported for work, she added. Camacho said DEQ has only one solid waste enforcement officer who can issue citations to commercial and industrial establishments that violate anti-litter law. In Sept. 2006, 20 litter control officers were provided citation booklets, summons, sheets for narrative report and the Litter Control Act Complaint report during the signing of the National Public Lands Day Proclamation at American Memorial Park. They were also provided uniforms — dark blue T-shirts with yellow print on the back. Those who were certified were personnel of the Division of Environmental Quality, Coastal Resource Management. the Department of Land and Natural Resources, the Department of Public Works, the Saipan Mayor’s Office and the Marianas Visitors Authority. The officers also went to schools and met with different community groups to discuss the anti-littering law which imposes a maximum fine of $500. A month later, the officers published a photo of the trash dumped at the 13 Fishermen Memorial Pavilion and warned the people responsible that they would be cited next time. Camacho, in an interview yesterday, said she did not receive citations from the litter control officers in fiscal year 2008. But DEQ continues to spearhead monthly cleanups, she added. The problem, she said, is that “litter bugs” never tire of dumping trash — every time DEQ and volunteers conduct a cleanup, there’s always trash to pick up. Since the government still has to address its manpower issue in able to fully enforce the law, Camacho said officials may want to consider using surveillance cameras to identify violators. I'm not going to give a treatise on littering in the CNMI in this blog post, but it does not surprise me that not a single litter citation was handed out in 2008. There are a number of factors contributing to this, number one being the extreme aversion the CNMI government has towards enforcing laws. In many instances the apprehending officer feels bad for the perpetrator and will just let him go. Or the attorney prosecuting the case won't want to push for a stiff sentence. Or the judge will let him off with a $25 fine and time served. And I'm not just talking about littering. The other problem is that in making enforcing the litter laws everone's job, they in effect made it nobody's job. There are eight government agencies responsible and it is easy for one of them to pass the buck to the next. At the same time, the Legislature is trying to write revenue generating bills, which is an Orwellian synonym for raising taxes. If the litter laws were enforced, we wouldn't need to increase the cost of doing business by increasing fees. During the 11th Micronesians in Island Conservation Retreat I was tasked with taking over the learning network's blog found at http://mic-network.blogspot.com. I've fiddled with the template and the colors a little bit here and there over the last two weeks and I'm liking the new look. My first change was to turn the background from a solid green to a picture of two fishermen in an outrigger canoe. What says connecting islands better than a canoe? I also added a Sitemeter counter, some frequently asked questions, contact information, and changed things around a bit so that the site is easier to navigate (at least to me). In the past I've done a few widgets for organizations I've done work with (i.e. a logo that links to your website). I used that code to add logos that link to Friends of the Monument, Micronesia Conservation Trust, and Beautify CNMI. I'll add a few more logos as work progresses on the blog, including the html code so that you can link to those websites, too! As for the color scheme, I offer the fact that I am color blind as an excuse. 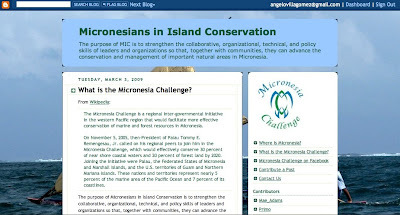 I encourage you to add a link to the Micronesians in Island Conservation blog. In the upcoming months we should be adding some great conservation stories from the whole of Micronesia. You heard it here first. Carnival of the Blue XXII is now live at Rick MacPherson's Malaria, Bedbugs, Sea Lice, & Sunsets. 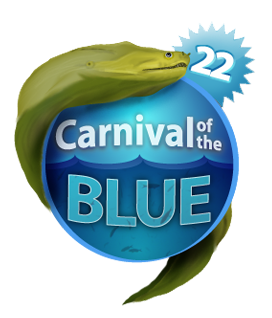 It has been a while since I've submitted a post for Carnival of the Blue, not like I don't post something about the ocean every single month, but I managed to get my act together this month. Enjoy! Are you a member of Facebook? Would you like to be the envy of all your friends? 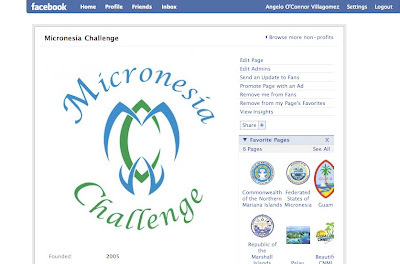 There is now a Facebook Fan Page and a Facebook Group for the Micronesia Challenge. Join today! Both the Fan Page and the Group allow users to post comments on a discussion board, upload photos and video, suggest links, and leave comments. The Fan Page allows the administrator to write notes or, as I prefer to do, syndicate a blog feed. I am syndicating the Micronesians in Island Conservation blog until there is a Micronesia Challenge blog. The thing I like best about both is that the administrator has the ability to send messages to every member of both the Group and the Fan Page. This will come in handy, especially once the membership gets into the thousands. So what are you waiting for? Log into Facebook and join the Facebook Fan Page and the Facebook Group for the Micronesia Challenge.